“We adopted our dog at around 9 months of age. She had never been housebroken and we were having trouble training her as well as keeping from jumping on visitors. Steve came to our home and demonstrated some techniques and provided suggestions for both the training and jumping. He made himself available for future questions. Abby did well, but as she got older she became skittish and no longer liked to be in the company of other dogs. This time Steve met us in a park and demonstrated techniques and taught us better ways to reward good behavior and discourage the bad. I had been to obedience classes with previous dogs, but Abby became overexcited with the other dogs and had to leave. I had never had a private trainer before and I was not expecting such a rapid behavior change after only a few sessions. I like that he spends a lot of time teaching us and demonstrating, listening to our concerns and specifically addressed the issues we had concerns about. I like that he did not push his services and accommodated our schedule. Abby is now housebroken and the jumping only occurs when our guests (despite us asking them not to) invite her to jump. I now use the Sit command for more than just a parlor trick, but to keep her “working” in a positive way. We are working on Down, Stay and Place. I have learned better ways to use treats and am beginning clicker training. 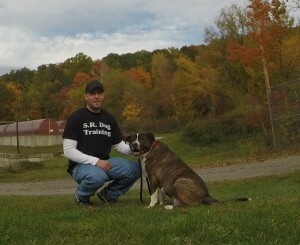 Abby still needs work around other dogs and I plan to contact Steve for continued training when the weather warms up. Boone is a young adult Lab who epitomizes his breed. He is a friendly, intelligent, and active young dog. 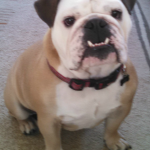 Boone had a tendency to run across the street to his neighbor’s home and chase passing cars. His owners contacted me for in-home dog training in Westchester County NY because they were concerned about his habit of running off. This is a common challenge for many dog owners and a potential safety issue for the dog. This is a prime example when at home dog training is required in order to achieve the best results possible. We were able to teach Boone to stay in his yard, by training him in his yard. 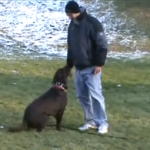 This would not have been possible with a group obedience class or training at a facility. The first aspect of training was to teach Boone what the perimeter of his yard was. We showed him what parts of the yard he was free to play and run around, and what parts he was not able to cross. The final and most important part of Boone’s training was to focus on improving and solidifying his recall (“Come”) command. We began with my beginner level obedience that uses positive reinforcement to teach him the “Come” command. This is a fun learning experience for both dog and owner. We completely off leash obedience trained Boone using low level remote collar training. Boone now has the freedom to run and play in his yard off leash and his owners have the peace of mind in knowing that he will come back when they call. My Adult Dog Training Program is designed to meet the needs of all dog owners. Whether you are dealing with leash pulling, behavior issues or want to improve obedience commands, I can help you achieve this. S.R. Dog Training is the preferred choice for in-home dog training Westchester County NY. 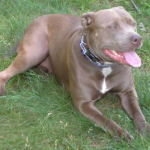 Coco is a very large female Pit Bull who was too much for her owners to handle. She had an incredibly high level of energy, lacked all obedience commands, and would jump on everyone she met (a definite safety issue). Needless to say, this prompted her owners to look for a dog trainer who specializes in dog training Westchester County NY. Coco’s family could not take her off the property for walks, as she would drag them down the road. Her lack of physical exercise led to an enormous amount of pent up energy. As a result, she destroyed items in the home (couch cushions, etc.) and escaped out the front door in order to run through the neighborhood. Coco is a sweet and friendly girl, but a BIG handful for her owners. We immediately addressed her leash walking issues and her habit of jumping on people. We then implemented a plan to handle her destruction of items in the home. Coco went through my beginner to advanced obedience training program, so she is now fully off leash trained using low level remote collar training. The remote collar acts as a communication tool, which gives Coco freedom to run/play in the yard and her owners peace of mind. An effective obedience training program should gradually progress in order to fairly and safely introduce the dog to all commands and expectations. I am extremely proud of Coco’s owners and the great success they achieved. This was a huge transformation! They took a big out of control dog and transformed her into a calm, obedient, and relaxed member of their family.